Raising a newborn is no easy task. For first-time parents, the experience can be particularly stressful as they adapt to a new schedule that features intermittent naps, diaper changes, and late-night feedings. 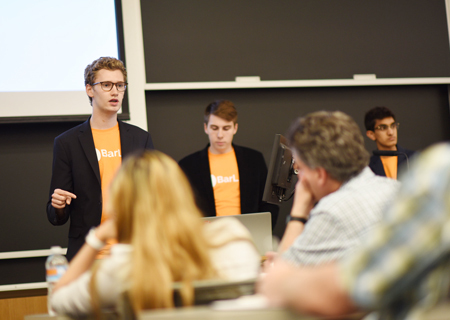 Fortunately, a Northwestern University student team is helping new parents acclimate to life with a newborn through BabyNinja, a mobile app that offers insights about their baby’s behaviors and activities. The platform, currently in a beta launch, logs common baby tracking data, such as eating schedules and the duration of sleep. The information can also be collected as easy-to-read reports that can be presented to pediatricians during check-ups. BabyNinja was one of the eight new, student-created, online businesses introduced at the final presentations of NUvention: Web + Media, a two-quarter course offered by the Farley Center for Entrepreneurship and Innovation that requires students to collaborate across disciplines to design, plan, and launch web-based businesses. On Tuesday, June 9, members of the class “pitched” their final products to an audience of faculty, peers, guests, and members of the NUvention board of advisors. Another NUvention: Web + Media app, called BarLift, provides users with information on drink specials from local bars while also offering bar owners an analytics platform to develop marketing campaigns that will increase traffic and revenue. BarLift maintains 600 active weekly users since launching the app last winter and counts 16 Evanston bars as customers of their analytics service, with an additional 28 establishments in the pipeline. The startup is in the midst of expanding their presence to DePaul University’s Lincoln Park campus and believes their app could eventually be adopted in cities across the country. 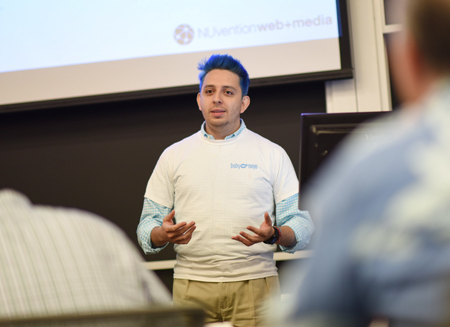 NUvention is a suite of interdisciplinary courses offered through the Farley Center that exposes students to the entire innovation and entrepreneurial life cycle and helps them understand how innovations can become viable businesses. In addition to NUvention: Web + Media, specialized course tracks include energy, analytics, and medical innovation. The program has spurred the development of multiple startup companies that have transitioned from the classroom to the corporate world.